Hallelujah – we have reliable internet again! 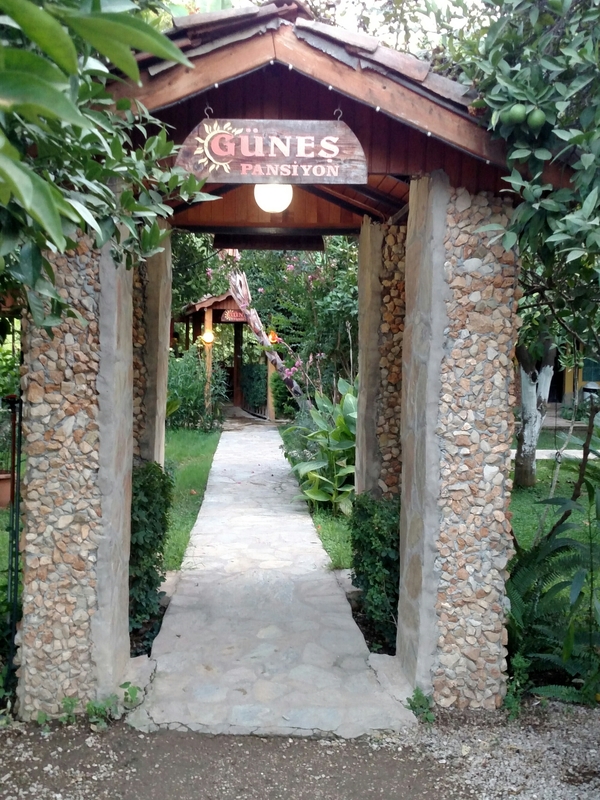 We’re staying in a nice rental house in Hisarönü, a town just outside of Fethiye. Upside: it has a washing machine. Downside: no internet. We corrected that this morning by picking up a mobile hotspot at Turk Telekom in Fethiye this morning, so are now reconnected with the mothership. I will never again travel without a mobile hotspot and local SIM-card. The kitchen is compact but functional, so Keith decided to try to make coffee using the aeropress he brought from home, with some coffee that Jen & Onur brought from San Francisco. Unfortunately, the coffee filters didn’t make it into the suitcase, so Keith sacrificed a T-shirt to make cotton filters. 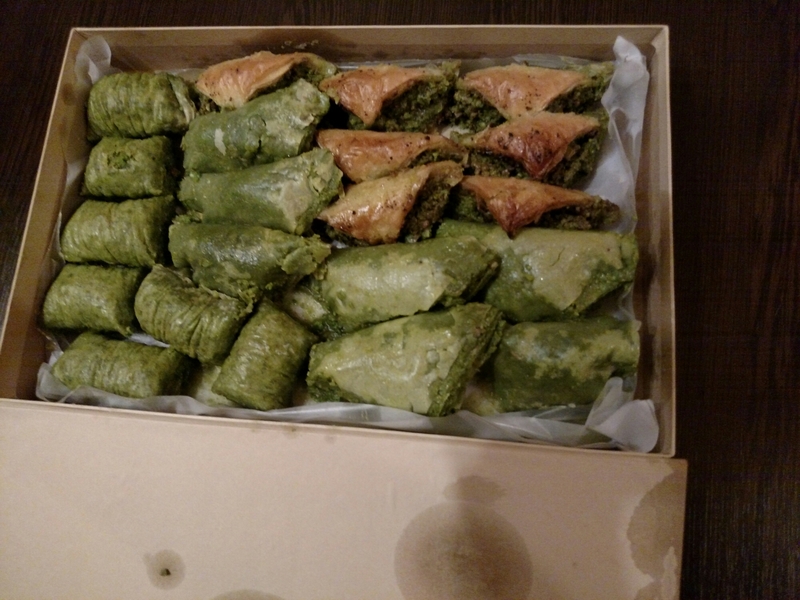 Keith, Jen & Onur reported that it worked pretty well, and was about as crunchy as Turkish coffee (which is far less prevalent in Turkey than I expected). 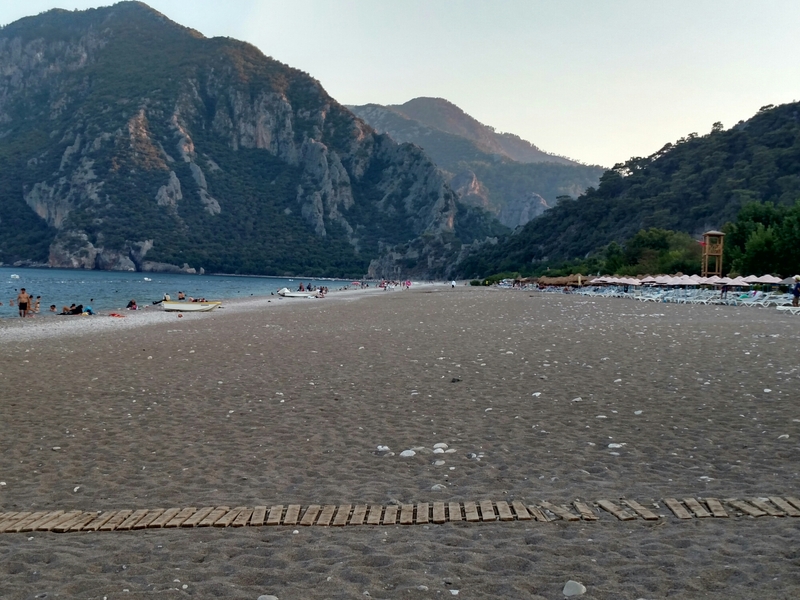 This afternoon we went to the blue lagoon at Ölüdeniz. It was probably beautiful 20 years ago, but is now over-run with beach clubs, where you see all forms of attire from speedos to burkinis. I’ve noticed that most residences that I’ve seen since we landed in Antalya have solar water heaters on the roof — it’s far more widespread than I’ve seen anywhere else. These are on apartments above storefronts on the main street in Hisarönü. On tall, older apartment buildings in Antalya, the rooftops are packed with stacked racks of different colors & brands — it looks like each tenant installed their own. I could definitely get used to this! We learned that the electricity would be out all day due to construction in the area, so decided to move on toward Fethiye. 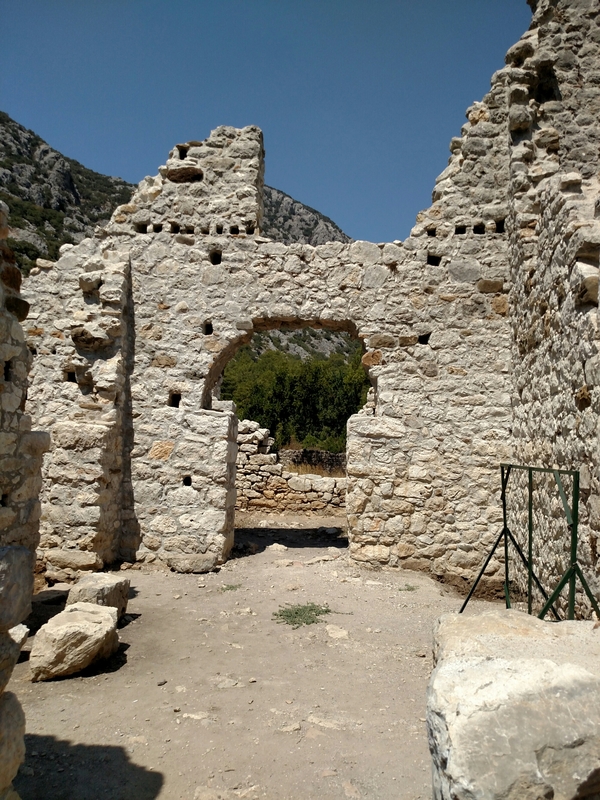 Along the way, we stopped in a beautiful town along the coast called Kaş – charming, clean, and no big resorts. We enjoyed kebab at Smiley’s, run by a woman from Gaziantep (who speaks beautiful English), then browsed carpet shops for an hour or so. We ended in a carpet shop where the owner had lived in San Francisco, and has a friend who has a carpet shop in Portland (“on Northwest 23rd, next to Papa Hayden’s”), which must be Babik’s Hand-Woven Treasures. It is truly a small world. 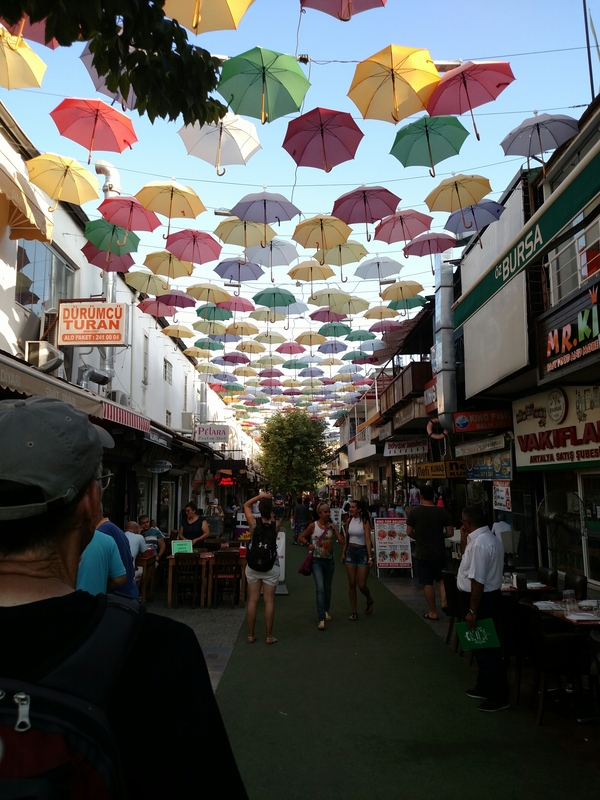 After Kaş, we drove to Ölüdeniz, which reminds me of the Santa Cruz Boardwalk on steroids. Keith, Sevgi, Jen & I waited there while Onur, Ömer and Berkay scouted out lodging & negotiated a price. This took quite a while, so we watched the sunset and watched dozens of tandem para-gliders come in for landings on the main beach front pedestrian walkway -it was entertaining to watch inattentive tourists scramble when they realized that they were about to be run over. I’ve been sidelined for 2 days with a persistent case of traveller’s trots. Symptoms started as we were leaving Istanbul, but became more pronounced yesterday, causing me to have to skip the boat tour that Jen blogged about here. Her photos of it are beautiful! Onur’s parents insisted that I see a doctor this morning, so we drove to the next town (Kumluca, population ~33,000) where we met up with a couple that Ömer knows there, who escorted us to the hospital where the wife is a nurse. (How fortunate is that!). We went into the emergency room, where I was seen immediately by a young doctor who shooed Onur out of the room because she knew enough English to not require his translation services. After being checked over, I was given an “enjeksiyon” and 3 prescriptions, and was out the door 30 minutes and $23 later. Ömer’s friends then escorted us to the pharmacy, where we filled the 3 prescriptions for just over $5. I invite anyone who is concerned about “socialized medicine” to experience it first-hand in Turkey! So, no other activities for me today, just R&R (rest & rehydration). We’ll probably spend one more day here in Çıralı before heading further up the coast to Fethiye, to make sure my digestive system is ready for about a 4-hour car trip. In addition to the resident dogs, cats and chickens here, we saw a hedgehog yesterday evening — a first for me (no photo, but Jen got one). Ömer tells me that at night, it’s quite lively; maybe we’ll walk over this evening to check it out. It’s fun to watch all of the animals interact. The chickens are pretty clearly in charge, followed by the cats, and finally the dogs. Life is good, especially from a hammock. 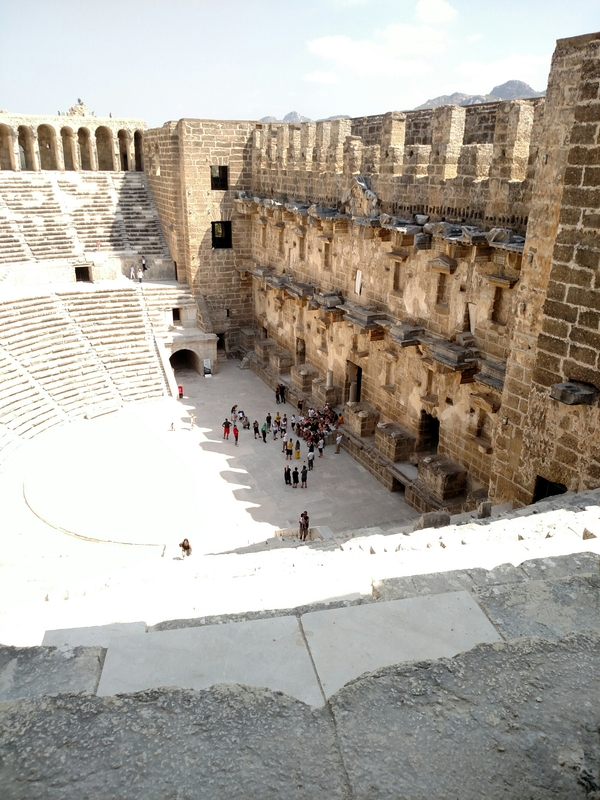 Today we drove to Aspendos, an ancient city (already established by 333 BC when it was conquered by Alexander the Great) that was part of the Pergamon Kingdom in the Attalid Dynasty until it came under Roman rule in 133 BC. 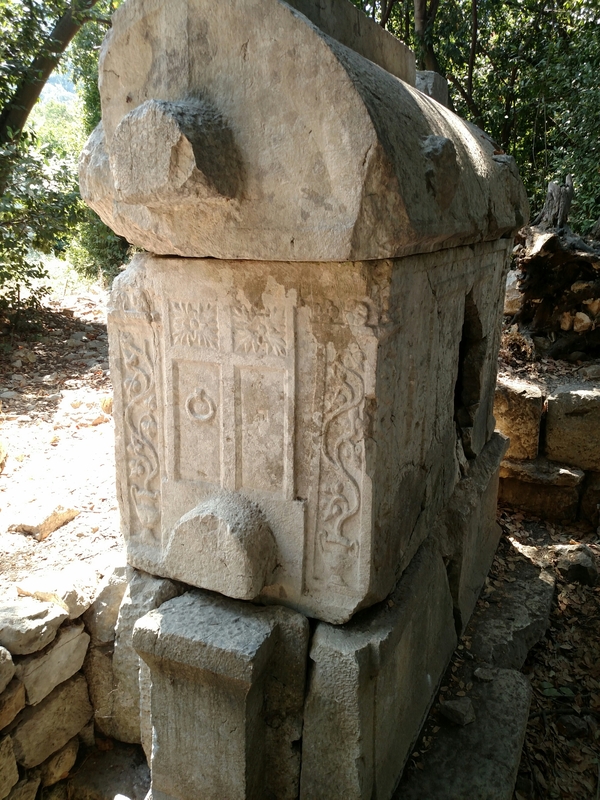 It reached its height in the 2nd & 3rd centuries AD. 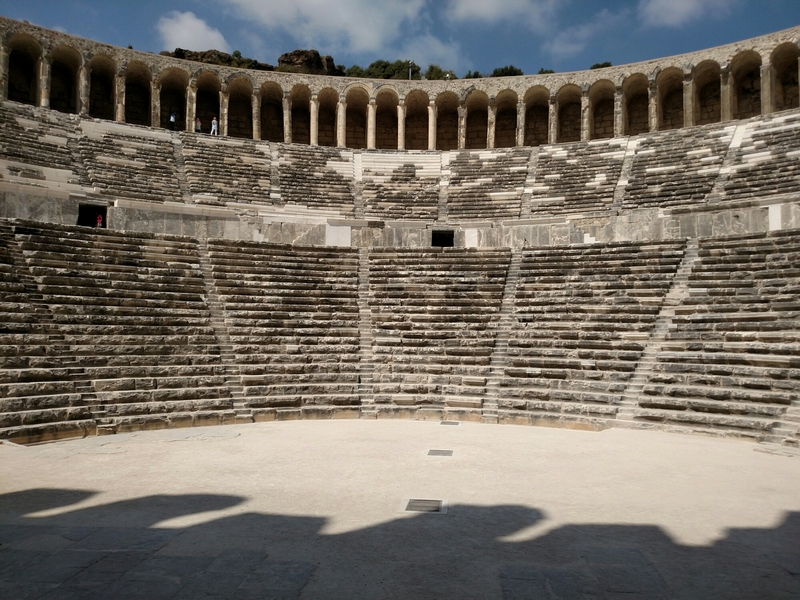 This theater was built during the late 2nd century during the reign of Emperor Marcus Aurelius, and could seat up to 15,000 people. 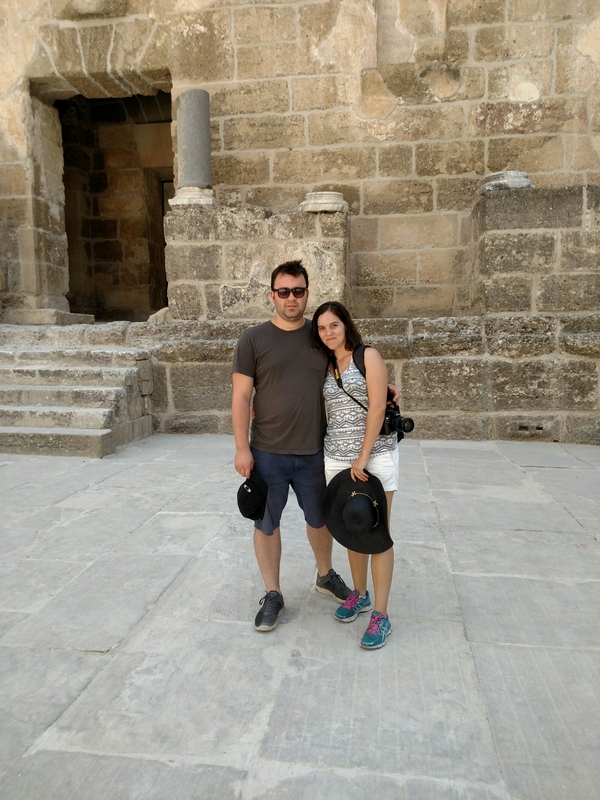 My legs pooped out after climbing up and down the 93 marble steps, so I enjoyed the shade while Keith, Jen and Onur explored more of the Aspendos ruins. Check out Jen’s blog (kabby88.wordpress.com) for more photos. 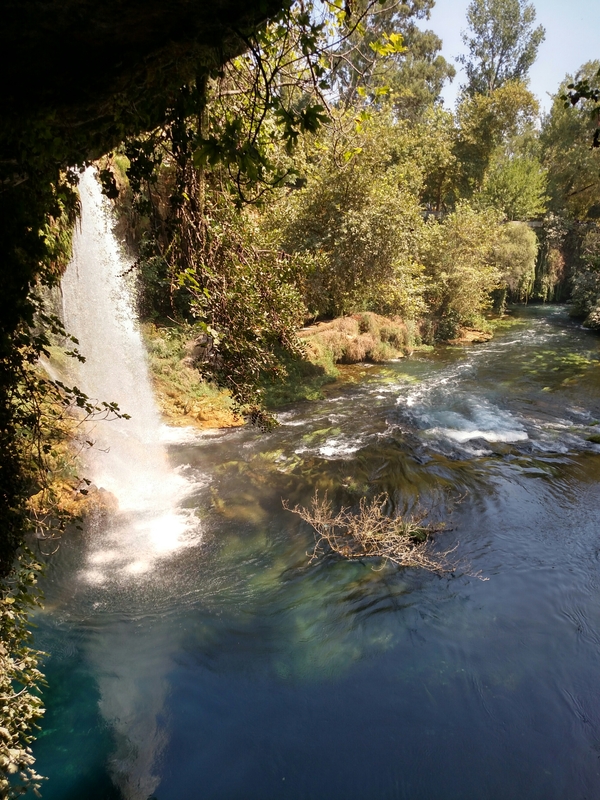 From Aspendos, we circled back to the Düden waterfall just outside of Antalya. It’s a cool, green oasis in the middle of dusty, dry suburbs — a real gem. The waterfall pours over cliffs that include limestone caves, so you can experience the waterfall from above, behind and below. 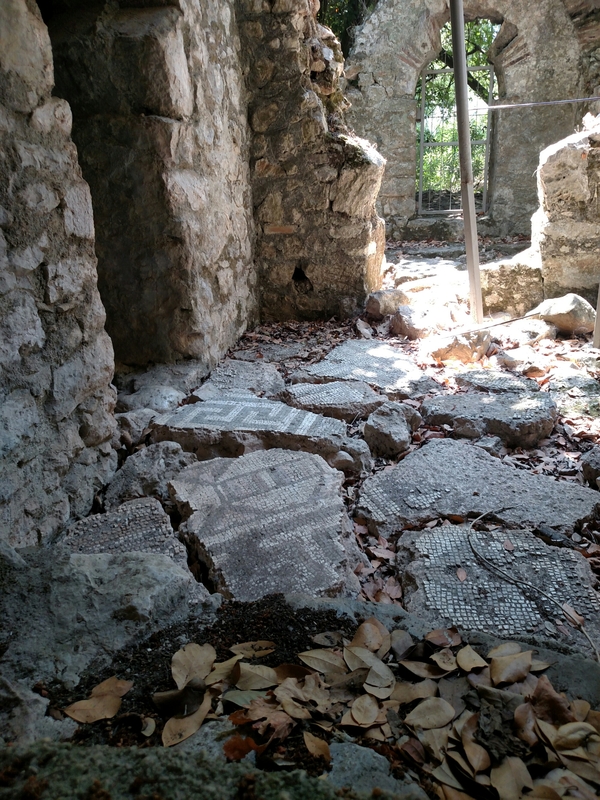 And unlike any of the waterfalls that I’ve visited at home, you have to navigate around various ancient Roman tombs on the grounds. 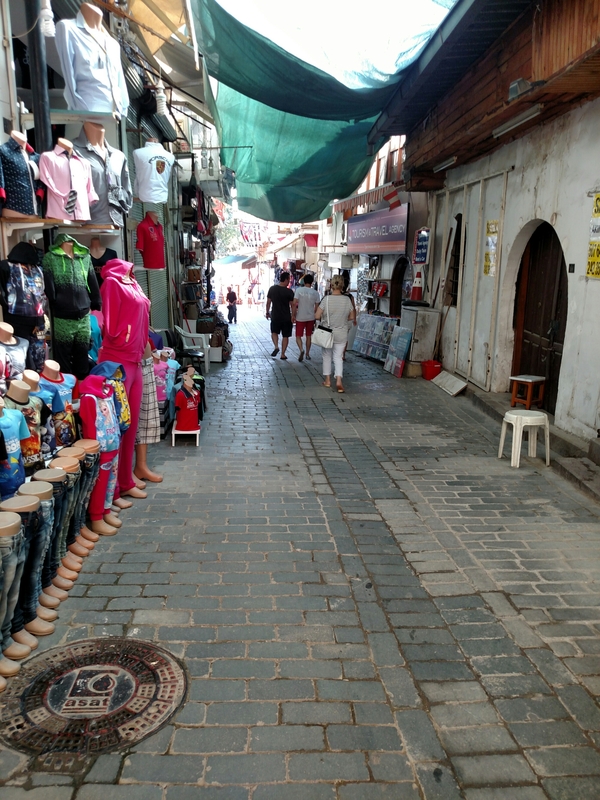 Kaleiçi was a walled Roman (then Byzantine, then Selçuk Turkish, then Ottoman Turkish) port city, with narrow winding streets, charming alleys, tall crenelated walls, and garish pirate-themed tour boats in the harbor. Wake up to the sound of chickens outside your cabin. Discover that there’s no hot water yet (solar heated). No problem – walk down to the beach for a pre-breakfast swim. The water is the perfect temperature – warm enough to be able to go right in, cool enough to be refreshing. And it’s salinity level is high enough that you float, almost on top of the water. 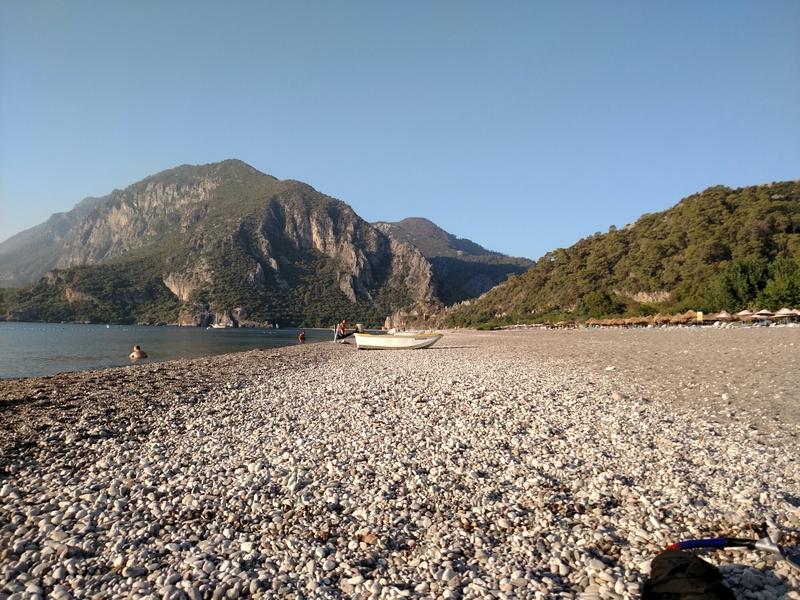 After breakfast, walk down to the end of the beach to explore the ruins of the ancient (~4th century BC) Lycian settlement of Olympos. Go back to the cabin and snooze in air-conditioned bliss (paradise is hot and humid). 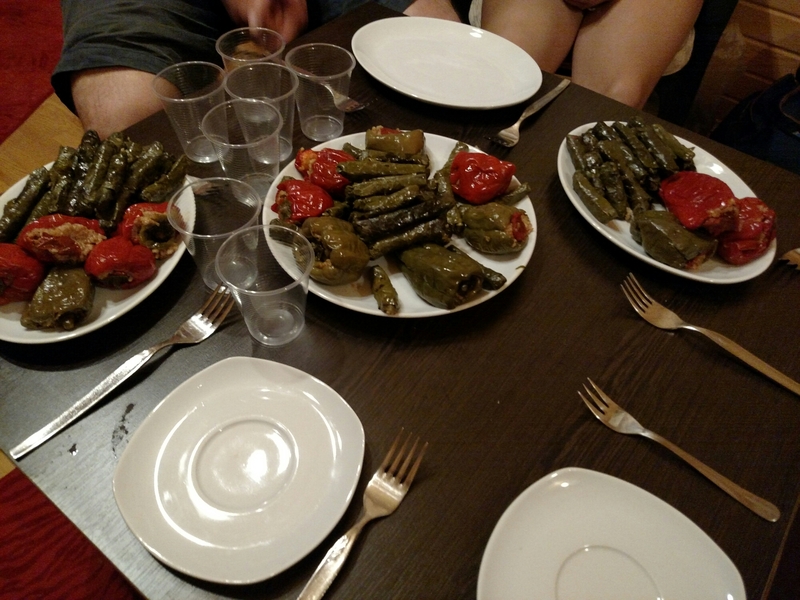 Enjoy a delicious dinner of yuvalama, a once-a-year special dish made by Sevgi and Ömer, outside under the trees. We met up with Onur’s family, who very graciously didn’t laugh at my rudimentary Turkish. I’m proud to report that I even completed my first commercial transaction in Turkish – purchasing a large bottle of water for 2 Turkish lira.